Barbecue is serious business in the Carolinas. The slaw pays homage to eastern tastes. 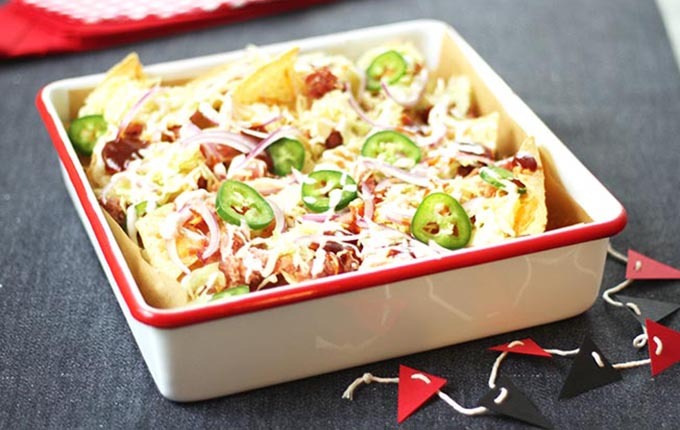 The sauces suggested for the nacho toppings are all-inclusive across the South—drizzle with your favorite regional-style sauce for a custom flavor. Preheat oven to 350°. Divide chips between two lightly greased parchment paper-lined half sheet pans. Layer each pan with 1 1/2 cups Monterey Jack cheese with jalapeño peppers, 1/2 pound pork, 1/2 cup Monterey Jack cheese, and 1/2 cup Cheddar cheese. Bake in batches, 12 minutes or until cheese melts. Top each pan with 1 cup Carolina Slaw and desired toppings. Bring vinegar and sugar to a boil in a small saucepan over medium-high heat. Stir until sugar dissolves. Remove from heat and whisk in next five ingredients; pour warm dressing over slaw mix tossing to coat. Chill 1 hour. A North Alabama classic gets a protein-packed update with Greek style yogurt. Makes 1 1/4 cups. Prep: 5 minutes. Whisk together all ingredients in a small bowl.